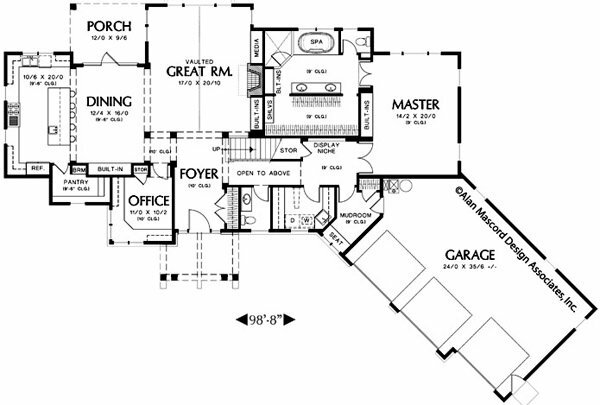 Floor plan designs often place the master suite and laundry room on opposite ends of the home. This keeps washer and dryer noise away from the bedroom and directs traffic patterns away. See a photo tour of this home, a version of the Cabot, with a white and back tile pattern in the laundry room accessible through the master closet. What are the most common locations for a laundry room? 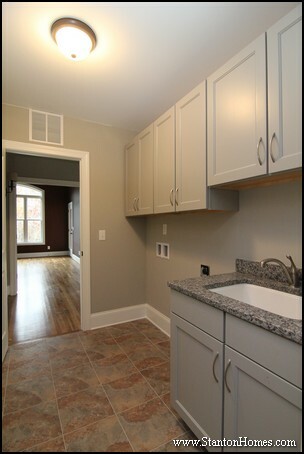 On the first floor, laundry rooms are most often kept next to the kitchen/garage entrance, mud room, and drop zone. On the second floor, laundry rooms are most often placed between kids' bedrooms or down a hallway (still keeping the master bedroom separated from laundry room noise and traffic). 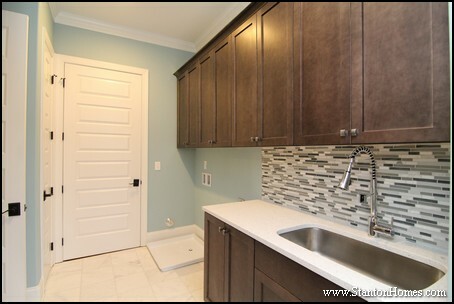 What are the latest trends in laundry room placement for Raleigh new homes? However, Stanton Homes is seeing a shift toward convenience in new home requests, with more home buyers asking for floor plans with the laundry room next to the master bedroom, with or without an additional door into the master bath or master closet. Where else can I have a laundry room? When building a custom home, there are always exceptions to common trends. 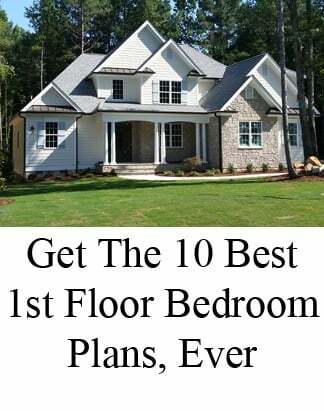 A very popular Raleigh home design, the Cotswold (pictured below), places the laundry room next to the master bedroom (without private access). This keeps laundry room facilities close by, through traffic. 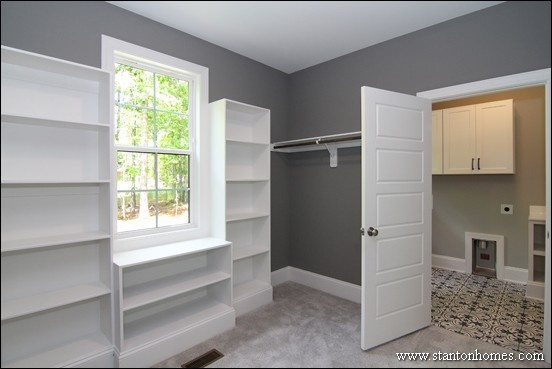 Below are examples of popular Raleigh North Carolina new home designs with laundry room access through the master closet (or very close to the master bedroom). Tell us your favorites! The master bathroom leads directly into the laundry room in this Max Fulbright design. Separate his and hers closets wrap behind the dual vanities. In this version of the Ingram, a two story Alan Mascord home design, the master bedroom has direct access to the laundry room / craft room through the walk in closet. 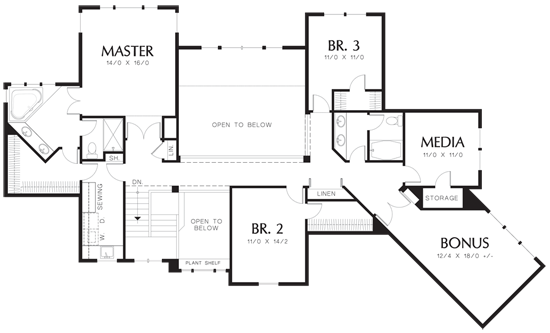 A two story design - with the master bedroom on the second floor - has the added benefit of keeping the laundry room on the same level as all (or most) bedrooms. 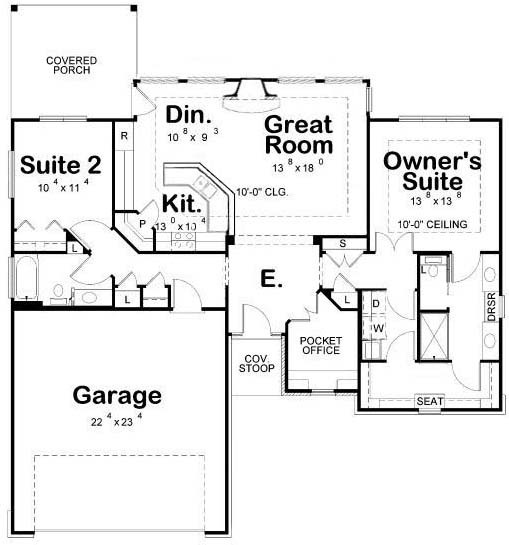 In this main floor master design, the laundry room is located just around the corner from the master bedroom. Ample storage cabinets, a built in ironing board, a sink, and two countertops create a functional design - with easy access between rooms. 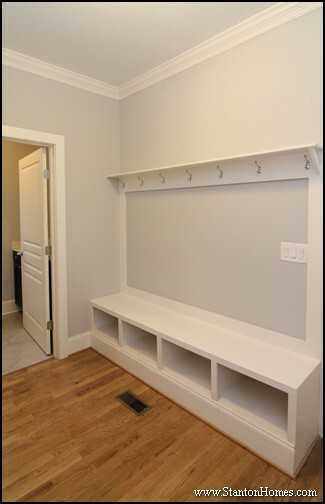 A separate mud room keeps the working laundry room clear of outdoor gear and everyday clutter. In this version of The Sherri, the master bedroom includes a private entrance to the laundry room, through the walk in closet. 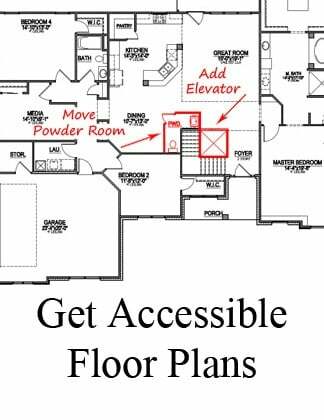 Access between the master closet and laundry room couldn't be easier. Inside The Madison, the first floor laundry room is located just steps away from the master suite. Across the hall, a linen closet offers tucked-in storage space. 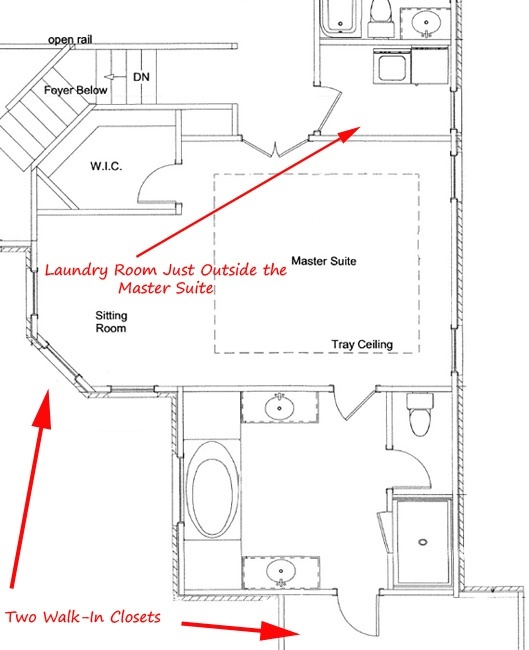 What is a Universal Design laundry room? What's the best location for a laundry room? 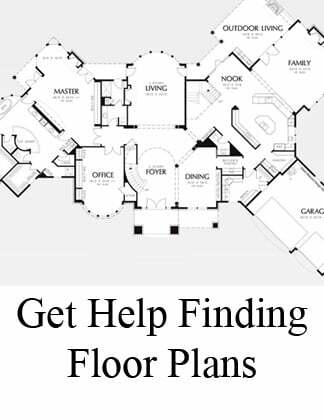 Take a look at these important questions to ask when comparing laundry room floor plans and standard features from North Carolina new home builders. Then, see sample photos with the pros and cons of a first versus second floor laundry room. Types of storage: how many cabinets are "standard" in the size laundry room you want? 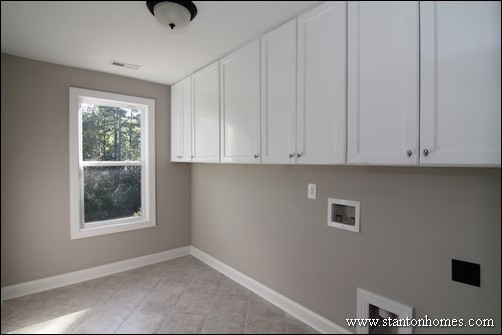 Does the builder offer cabinets or "shelving" which can mean open (or wire) shelving with no door? 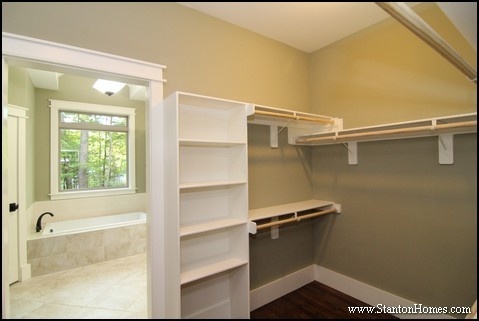 All Stanton Homes are built with painted wood shelving. Counter tops: are counter tops included? If so, how many linear feet? 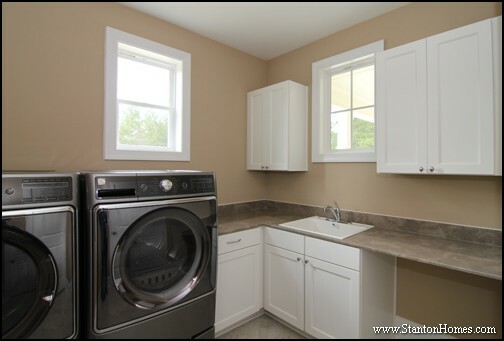 Pros: A first floor laundry room can be located near the garage - and serve as a catch-all laundry / mud room. Just add a sink and counter top, and you've got a family and pet station. 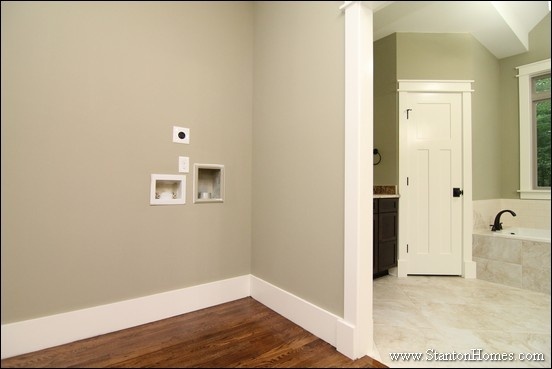 A secret or pocket door can give private access to the laundry room, from the master closet. 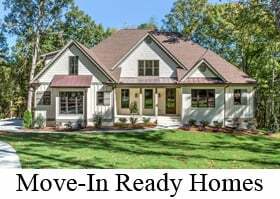 Take a tour of this home, the Cabot, near Chapel Hill NC - schedule your visit here. 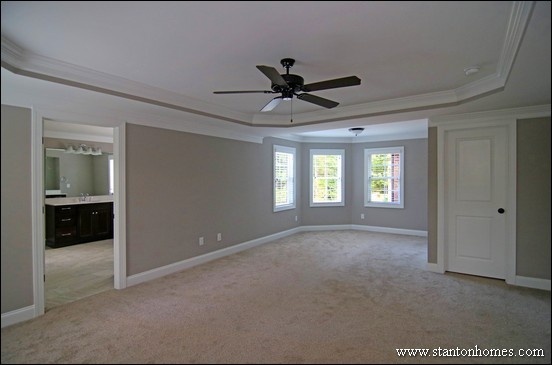 This new home has a private washer and dryer located inside the master closet. 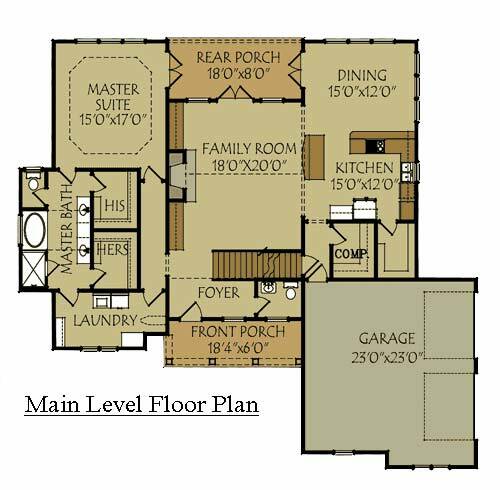 Two laundry rooms, or a laundry room and a laundry closet, are more common in Dual Master or Multi-Generation floor plans. 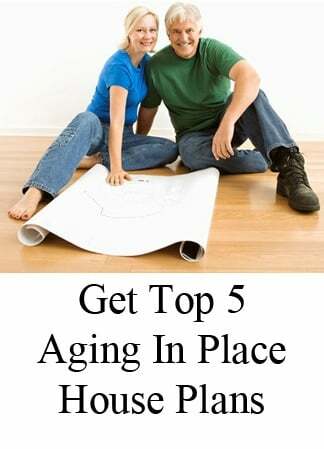 Get our top 20 Multigen plans, here. When all the bedrooms are upstairs, it can be more convenient to keep the laundry room on the second floor. 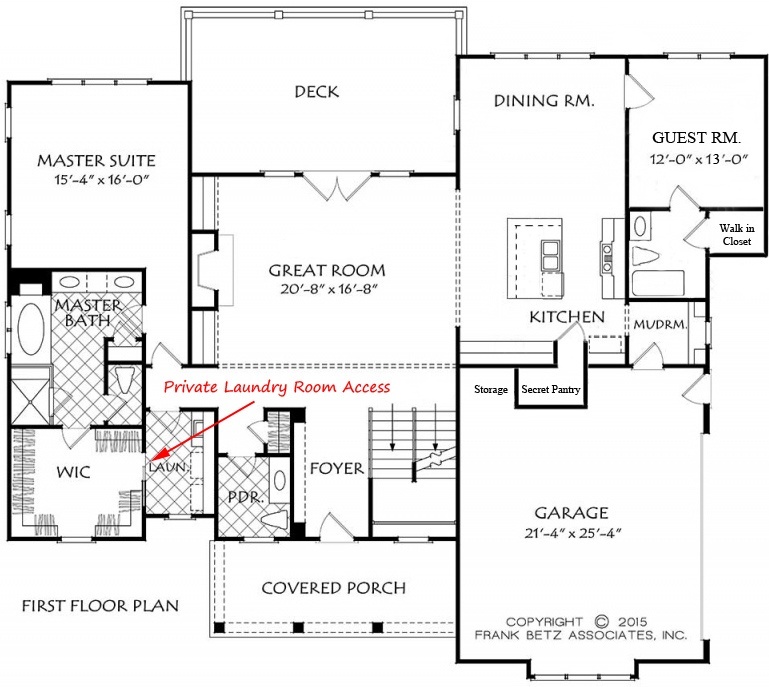 See the floor plan for this home, with an oversized second floor laundry. 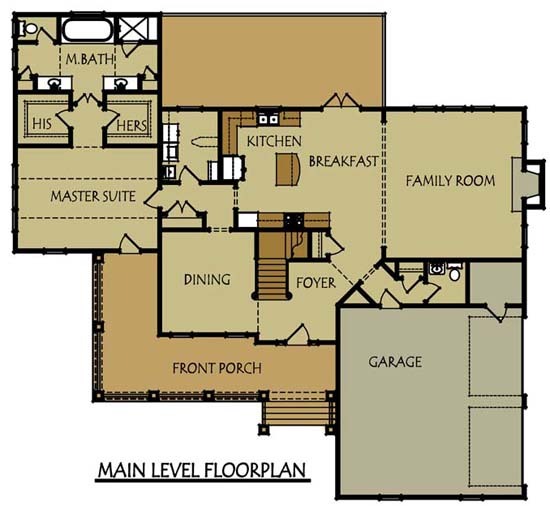 Floor plan designs typically place the master suite and laundry room on opposite ends of the home. A separated layout keeps washer and dryer noise down, and it directs traffic patterns away from your bedroom. Stanton Homes is seeing a shift in new home requests, with more home buyers asking to see floor plans with the laundry room next to the master bedroom, with or without an additional door straight into the master bath or master closet. Here are a few favorite North Carolina new home designs - with a laundry room close to the master bedroom. Ample storage cabinets, a built in ironing board, a sink, and two counter tops create a functional design - with easy clothing transportation between rooms. 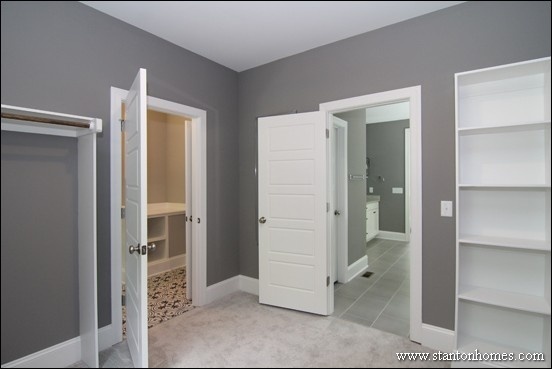 In this laundry room, doors lead to the master closet and main hallway. An extra large drop-in stainless steel sink with spray faucet adds a sleek and practical design.